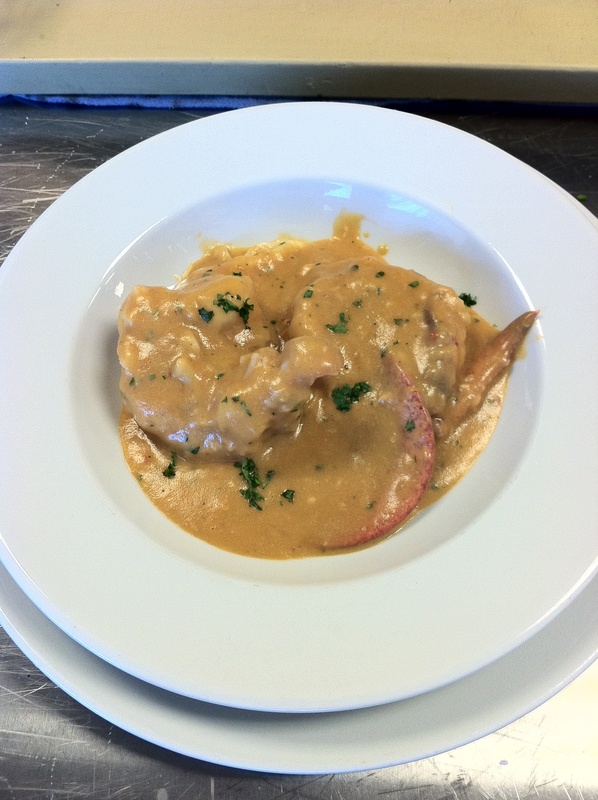 Day 20 – Practical Exam and more recipes! I don’t have any pictures from today, as it was test day. Thanks to everyone for their encouragement and for their faith in my test taking abilities. The written part was too easy (Chef – you need to make them harder to separate the girls from the boys – go girls!). The first practical, “time trial” of three different time trials of the day threw me a bit. I barely finished and it showed in the quality of my taillage (uniform cuts of vegetables – jardiniere turnips, diamond-shaped potatoes, and julienne carrots). However, looking at my marks, it turned out better than I thought. Yes, I passed! So, onto Level 2! 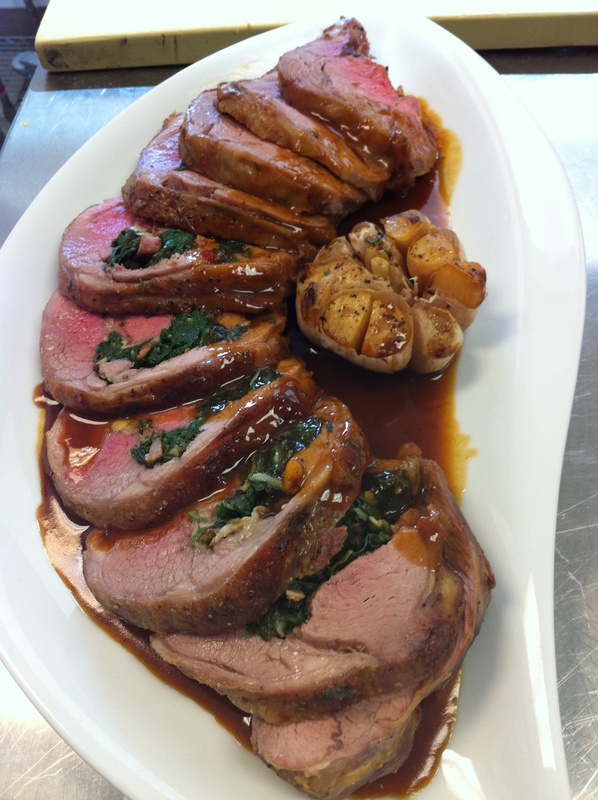 But before that, I’ll post one lamb recipe from yesterday at the request of Mom2. Bee Leng, I’ll post the lamb stew either later tonight or tomorrow. 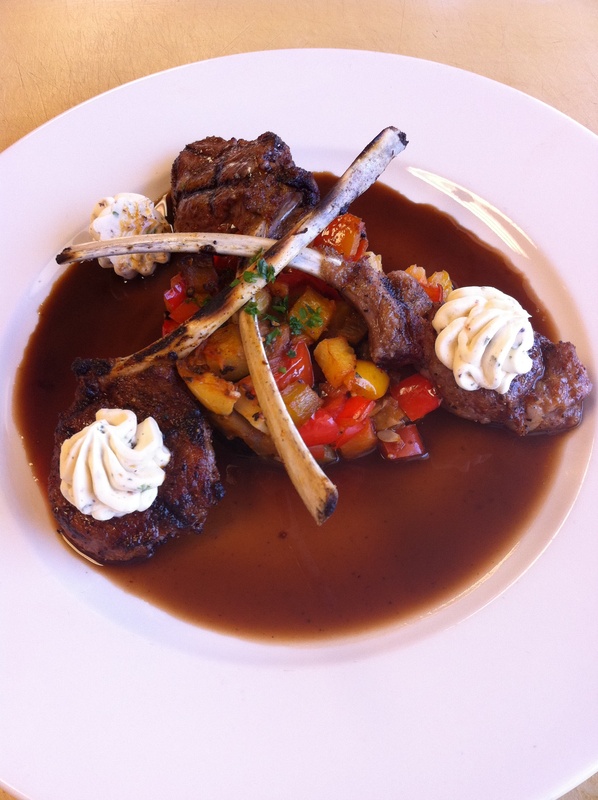 Lamb Chops/Lollipops with vegetable ragout and roasted garlic butter. This recipe will take you a bit of time if you’re the only one prepping all of the vegetables. So, I suggest opening a bottle of pinot noir and inviting a friend who has some quick knife skills to join you for the prep and dinner. Make sure to prep ALL ingredients, first, starting with getting the garlic in the oven. Then, work on the vegetables and finally the lamb, as that will be the fastest to cook. I. For Vegetable Ragout: 1) 1/2 onion, diced; 2) 2 chopped tomatoes (seeded, first), 3) 2 garlic cloves, minced; 4) 1 zucchini, diced; 5) 1/2 purple eggplant, diced, and sprinkled with salt to bleed the water out of it for 15 minutes or so; 6) 1/2 red bell pepper and 1/2 yellow bell pepper, diced; 7) any fresh herbs, minced; 8) olive oil for sauteeing and salt and pepper to taste. II. For Chops: 1) 8-10 lamb chops, frenched (this will be enough for 3 people – I would do approximately 3 chops per person); 2) 2 T oil; 3) dry spice rub made of the following, 2 teaspoons each of: paprika, ground cumin, salt, and black pepper. You can actually use whatever spice mix you like. I’m fond of heat, so I would add a bit of some spicy pepper like cayenne and I also like garlic, so I’d probably add granulated garlic. III. For Roasted Garlic butter: 1) 1 head of garlic; 2) a little olive oil to rub on garlic head; 3) a few Nicoise olives, diced; 4) 1 sprig fresh rosemary, leaves finely diced; 5) butter; and 6) salt and pepper. I. For Roasted Garlic, compound butter: This should be made first, if you want to pipe it out in cute medallions and refrigerate to set up (see picture on Day 19). 1) Remove the top 1/3 of the head of garlic; 2) Rub with olive oil and wrap loosely in aluminum foil, including just a splash of water in with the oil (you want it to steam a bit); 3) Roast in 350 degree F oven for approximately 45 minutes or until soft; 4) When garlic is tender, puree it and then whip it in with the butter and the rest of the ingredients until smooth; 5) Fill in pastry bag or a baggie with one corner cut off, and pipe out little rosettes (or whatever design you like) on parchment paper; 6) Put in freezer or refrigerator to cool and set quickly. II. For Vegetable Ragout: This is basically a stove-top ratatouille that is finished in the oven. 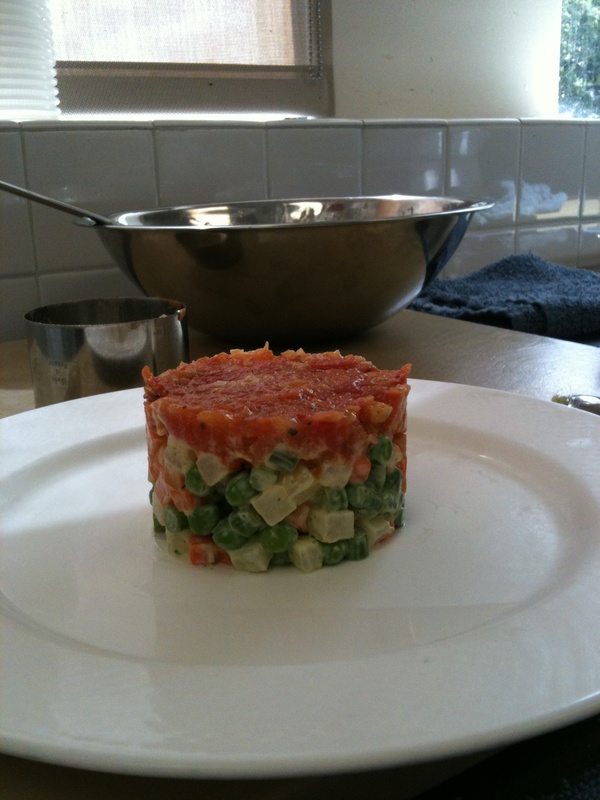 For presentation, you want everything diced (except for garlic) uniformly. 1) Sweat the onion in some olive oil; 2) When soft, add garlic; 3) Next add the bell pepper, then the zucchini, then the eggplant, developing each a bit before adding in the following ingredient; 4) make sure to season with salt at this point, as anything in the zucchini/cucumber family definitely needs a hit of salt (yes, even though the eggplant has salt on it – that’s minimal unless you overdid it); 5) Add in the tomatoes and fresh herbs and keep stirring a bit so that all flavors meld together, but are still done “al dente” – about 3-5 minutes more; 6) Get out a ring mold or put in a good looking oven-proof dish and finish in 300 degrees F oven for 10-15 minutes. II. For the Chops: While your ragout is finishing in the oven, prepare and cook the chops. 1) Make sure you have a preheated grill on high – 400-425 degrees F (although I might have it a bit lower, as I think the chops are delicate and I don’t want to burn them; 2) Rub the chops with the spice mix on both sides and put a little oil on each side over the spices to seal them in; 3) Grill chops for 1-2 minutes each side, making sure to get the lovely looking diamond grill marks (quadrillage) and then place on an oiled sheet pan to finish in the oven for approximately 3 minutes, if you want your lamb rare. The chops are usually pretty small and the meat is best awesome rare-ish, so really watch these babies so you don’t overcook them. If you want them medium rare, leave them in another minute. Remember, they will continue to cook as you let them rest, so a little underdone than you want will likely be just right when you plate and finally bite into them; 4) Take the ragout out of oven, place on a warm plate, put 3 lamb shops on top, and mount the butter rosettes on each chop, if you like. 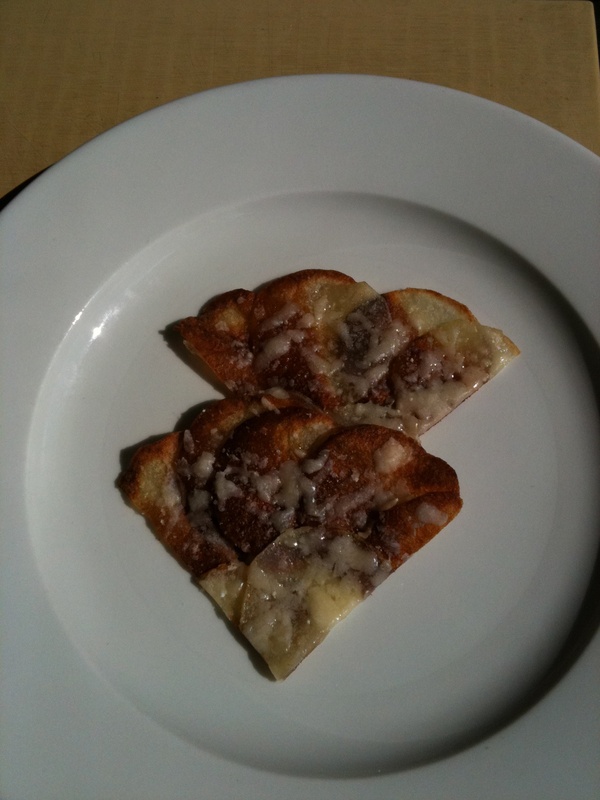 Or, serve the butter in the middle of one, depending upon how much better (and bread) you want with them. See picture on Day 19 if you’re looking for presentation ideas. E voila! Today was my favorite day so far because it involved my favorite protein – lamb. Ian and I were partners and, as usual, it was a lot of fun! Chef Peter demo’d a stuffed lamb leg, featured below. Delicious. Then, it was onto “lamb lollipops”. The dish was grilled lamb chops with a vegetable ragout (actually, ratatouille) and roasted garlic butter. That dish is the featured picture at the top of the page, and Ian is eating a lollipop, below. Apparently, I chose the perfect partner today, as he grilled them perfectly to rare with lovely grill marks on the outside, as lamb should be had. This was quite possibly the best dish we’ve made to date. Well done, Ian! I don’t have time to type the lamb lollipop recipe now, but I will post it later this week. 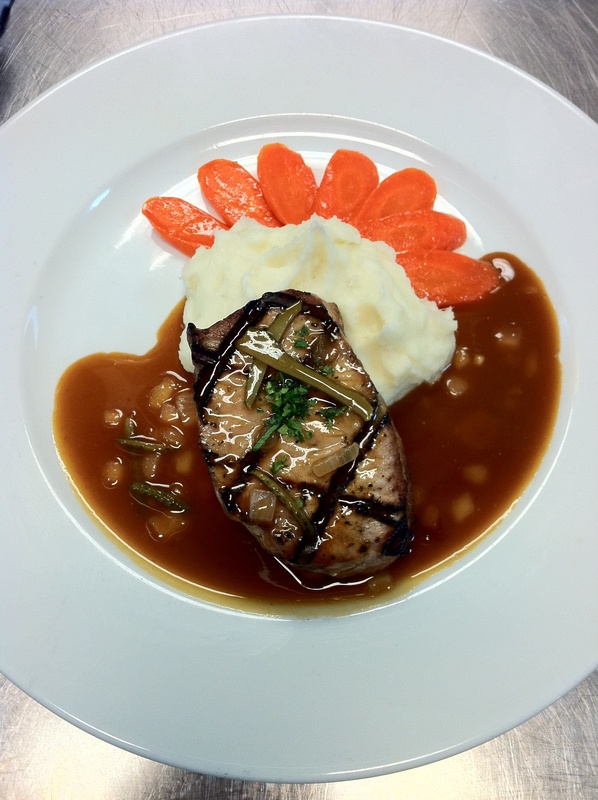 I have to play with more food tonight in preparation for our practical exam tomorrow. Happy eating! MMMMM, baby back ribs. Chef Peter made a great spice rub on these and I chowed. I can’t believe I’m such a meat eater these days. The spice rub: lots of paprika as a good foundation, black pepper, cayenne, white pepper, sugar, garlic powder, onion powder, thyme and ?. I forgot the last ingredient 😦 At any rate, I think this was the best thing I ate all day. 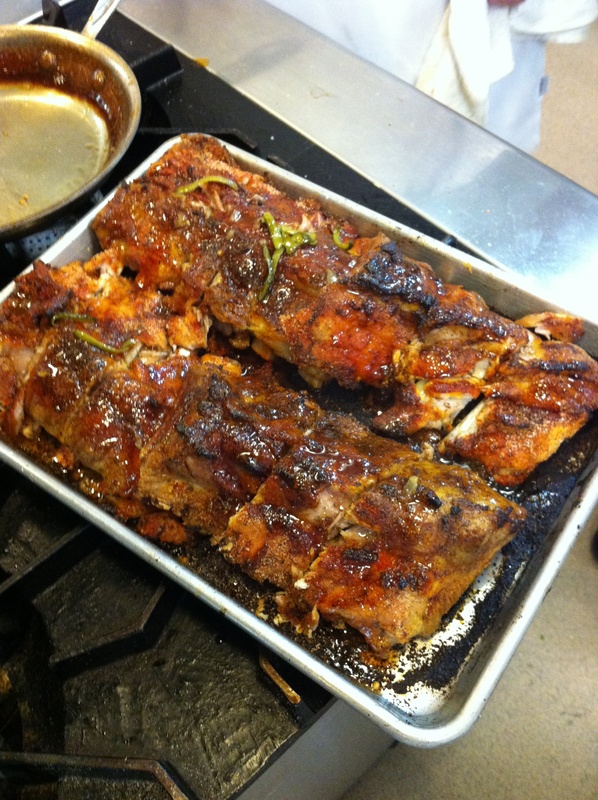 And, I loved that I got to play with Chef’s really sharp knives and remove the ribs from the loin. That was my first time playing with a large cut of pork from which I made 12 cutlets. I now have a fascination with wanting to butcher livestock. I’m like a little kid in a candy shop, but the fascination is now around large cuts of meat. But, our second dish…wow, we imploded. I started it. I added the remainder of our reduction from the first dish to our finishing sauce for the first dish, so we had no reduction to use as the basis for the second dish. The second dish had a “sweet and sour sauce”, so the flavor profiles were really different. That meant we had to doctor some new veal stock and reduce it to try to get a good reduction again. 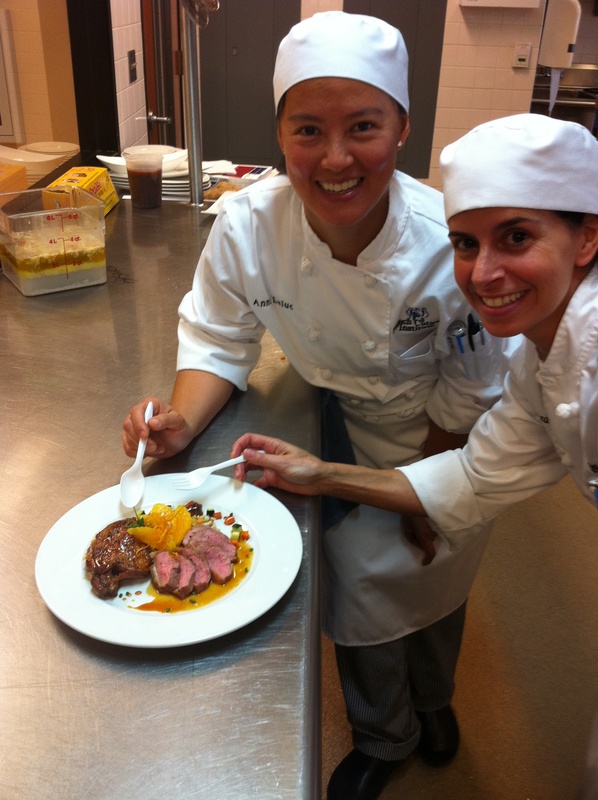 Then, we each ruined our respective gastrique and crystalized fresh ginger and orange zest. So, there were 2 more “do overs”. Then, while we were re-doing those items, our potatoes overcooked (which is ridiculous that I let them go that far since I’m the one who always likes things a little undercooked). Then, we couldn’t find a thermometer that read the same temperature on the same piece of meat so it was hard to gauge when the pork was done. 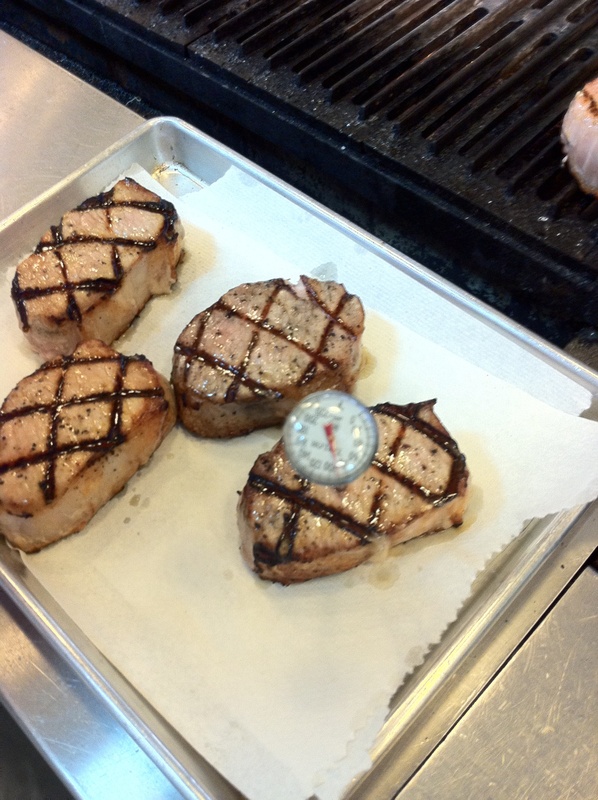 Why did this thermometer read 90 degrees F when the pork was likely at least 125? Were we in some sort of willy wonka vortex? At least we didn’t get sucked into a ceiling mounted exhaust fan. Actually it wasn’t nearly that bad. We did manage some nice grill marks. And we did save the dish in the end because we improvised and it actually tasted quite nice; it just wasn’t the perfect sweet and sour sauce (but, I ask you, did the French really invent sweet and sour sauce? hmmmm, I’m suspect.) So, my take-away lesson was that I need to be comfortable with improvising very quickly when something goes wrong because s*it is going to go wrong in a commercial kitchen. Seems like a simple lesson, but I don’t like to get things “wrong.” Sigh. But, tomorrow is another day – lamb day! I’m psyched. Maybe some sleep will help. My awesome husband bought us tickets to “Peaches and Tango” at Farmer Al’s Frog Hollow Farm on Saturday night. Unfortunately, Carnet had to go out of town, so Bobbie was the lucky recipient of Carnet’s ticket. Peaches and Tango was a fundraiser for Alice Waters’ Edible Schoolyard, a project of the Chez Panisse Foundation in which school kids participate in all aspects of growing, harvesting, and preparing nutritious, seasonal produce. The event was spectacular. 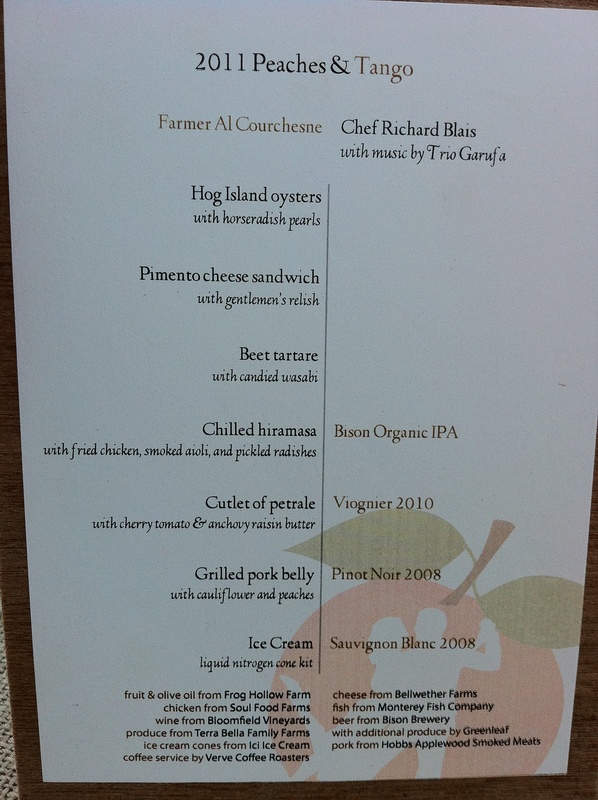 Richard Blais (pictured above, with me) put together a scrumptious menu (below), and Bobbie and I had an opportunity to ride around with Farmer Al in his golfcart and check out the peach orchards and olive trees on his farm. The beet tartare appetizer with candided wasabi was the bomb. The oyster presentation was very creative, but unfortunately there were too many horseradish pearls (think liquid nitrogen meets prepared horseradish = freezing, tapioca-sized pearls) on each oyster, such that the texture of the pearls overwhelmed the oysters. Bobbie and I were in agreement on this. The chilled Hiramasa with chicken cracklins and smoked aioli was definitely a winner, as was the caper/raisin/anchovy butter underneath the petrale cutlet. The wine from Bloomfield vineyards was lovely and they did a nice job pairing Bison Brewery’s IPA with the first course and Bloomfield wines with the remainder. We watched how the liquid nitrogen, plum ice cream was made, which was cool. However, it didn’t work for me, as it tasted like cherry bubble-gum to me instead of fresh plums. I believe kids would love it. We listened to a tango ensemble and watched some tango dancers rip it up in the middle of the peach orchard on a perfectly clear night with lots of stars. Farmer Al was a kick. He taught at Punahou School (where I also taught, many years later) and lived on Oahu, so we promised to stay in touch. What a great foodie event it was! Oh yeah, and the day before at school we prepared two lovely beef dishes, which Carnet, Paul, Igor and I had as appetizers before laying into way too much food (and more oysters!) at Serpentine. 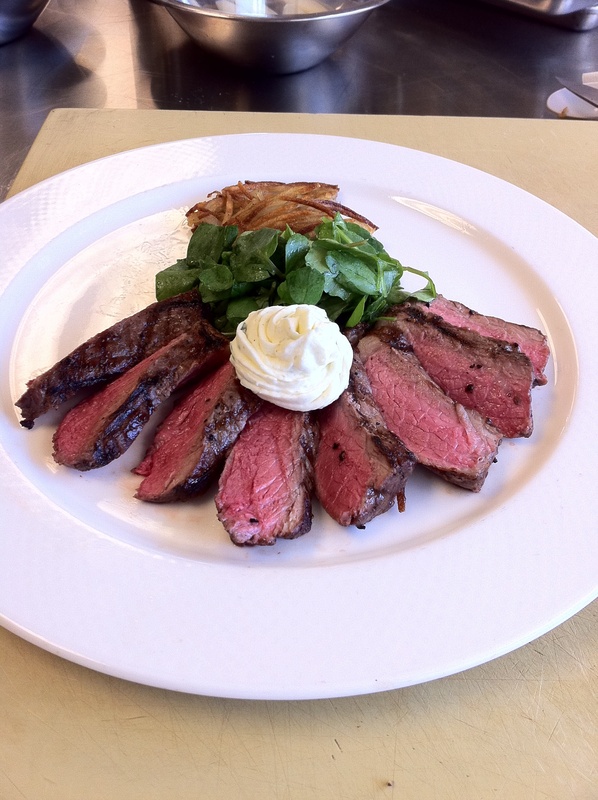 One dish was a beef medallion with bordelaise sauce: The other was a grilled strip loin with compound butter (below). I have pretty much always left the grilling to Carnet and to my mom and dad before that. So, I struggled a little bit with knowing when to take the meat off the grill. I was so nervous about over-cooking it that I took it off the grill way too early. Luckily, I had some time to finish it in a hot oven and the final product was delicious. But, the medallion….oh that lovely medallion. I’m not a huge beef lover, as I prefer lamb, but that medallion would turn anyone who is on the fence about beef into a true beef fan. It was about the cooking (I’ll take some credit for that), but it was really about the sauce. I could have bathed in it it was so delicious. Below, I’m going back a few days to detail a few condiments I liked: 1) the orange gatrique we used with the roast duck, which I think would also be excellent with chicken, and 2) a mignonette topper for oysters on the half shell. The Orange Gastrique is simple and delicious to drizzle around the plate as a sweet/vinegar-y accompaniment for chicken. For the gastrique, you’ll need about 3 T of sugar, approximately 4.5 oz of white wine vinegar, zest of one orange, and a splash of orange liquor. Directions: 1) In a small saucepan, caramelize the sugar by bringing the pan up to med-high heat and shaking the pan a bit until the sugars break down into a carmel looking liquid. You can add a very small amount of water at the beginning so you don’t burn the sugar, but if you add too much water, you’ll turn it into rock candy. 2) Then, once your sugar is light-med brown and has liquified, deglaze the pan with the vinegar. 3) Add in the orange zest and orange liquor and reduce the glaze a bit more until it’s a thin, carmel texture. If it’s too vinegar-y or sweet for you, you can add in a bit of stock and further reduce. But, you want the bite of this condiment, as you’ll use it sparingly around the protein as a way to enhance it. This whole process shouldn’t take more than 10-15 minutes, but you’ll need to watch it. 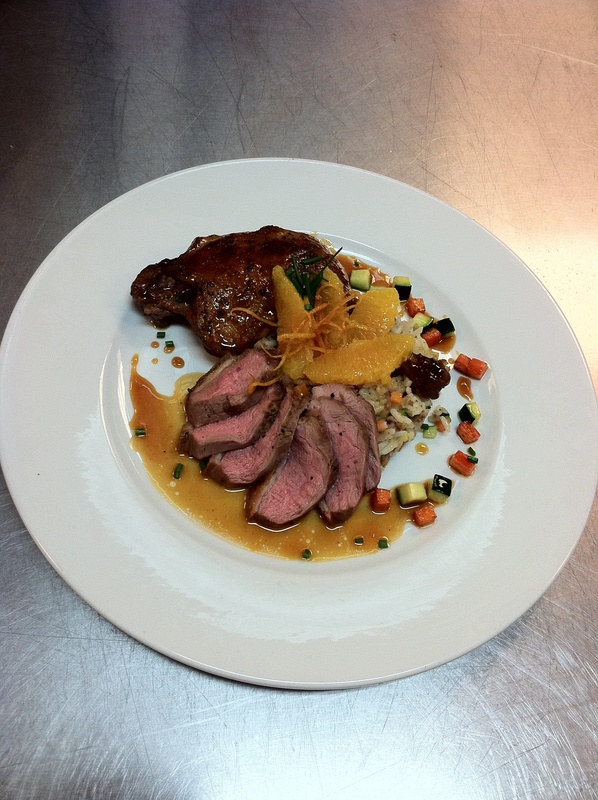 I also think that you could do the gastrique with peaches and peach liquor, and pair it with pork chops. Peaches are in season, so I think I’ll give it a try! The basis of a Mignonette is red wine vinegar, shallots and ground black pepper. 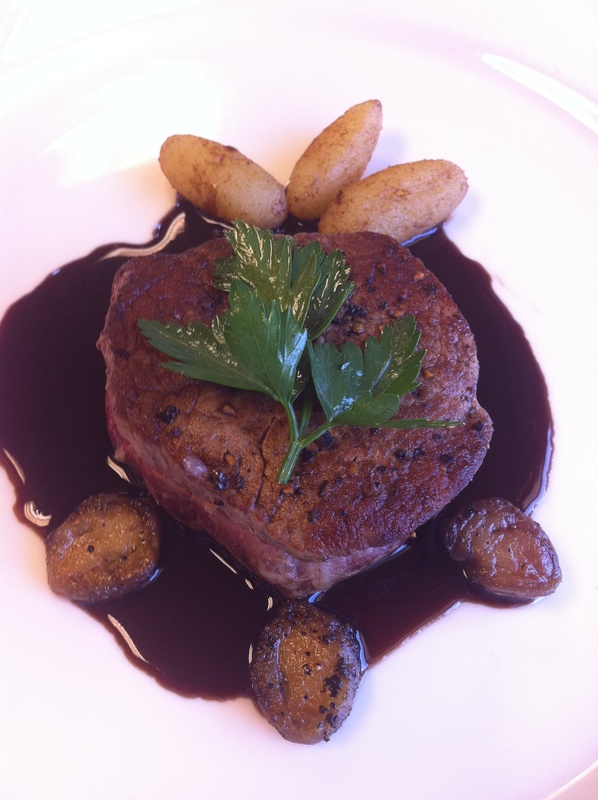 However, one of Chef Peter’s versions was stunning. He made a foam out of white wine vinegar, sugar, salt, black pepper, red chilies, and shallots. Then he put it all in a Vitamix (if you have a great blender at home, you can do it) and the flavors were so much nicer, with a good kick from the red chilies. This would also be a great condiment on something like a cucumber or carrot salad. Tomorrow is intro to pork and another test. And, Wednesday we have our first comprehensive for Level 1, which includes practical components. So for the next few days, I plan to practice deconstructing whole chickens, dressing fish, and tournage. Happy eating! 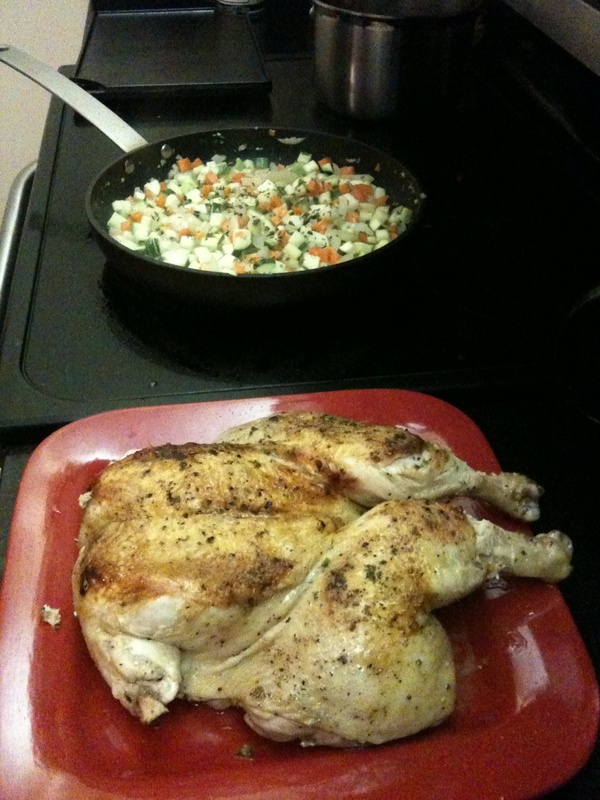 Day 15 – We made two chicken dishes. 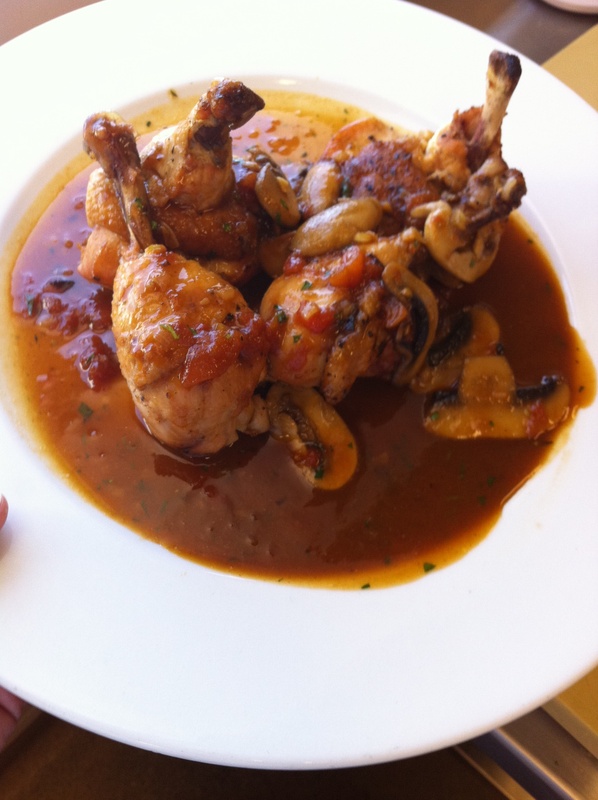 The one pictured above is essentially a poached chicken with a Mediterranean-style sauce made from the poaching liquid. 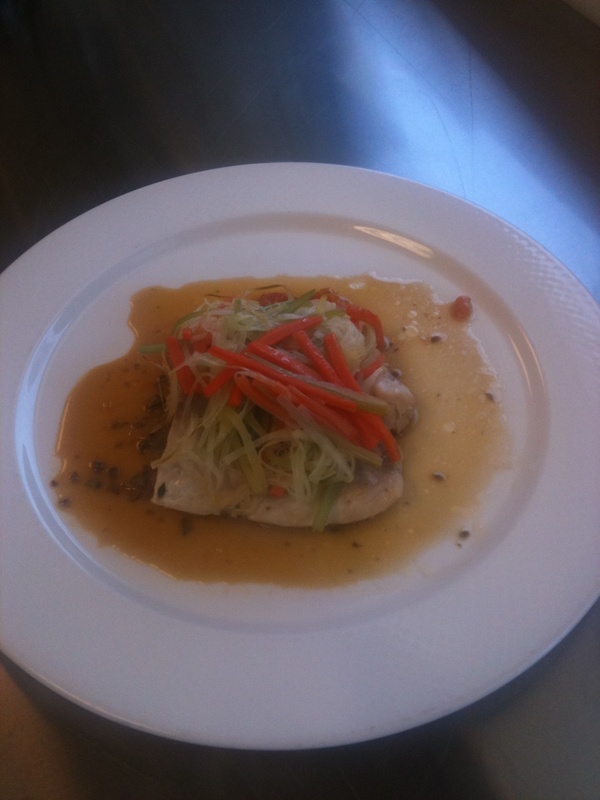 The next picture is of “Sauteed chicken, hunter style”. This one had a base of brown veal stock, which is really rich, and to that we added mushrooms, shallots, brandy, white wine, tomato fondue and fresh herbs. Delightful! Bobbie and I partnered on Day 15 and neither one of us is very good at dressing a whole chicken. 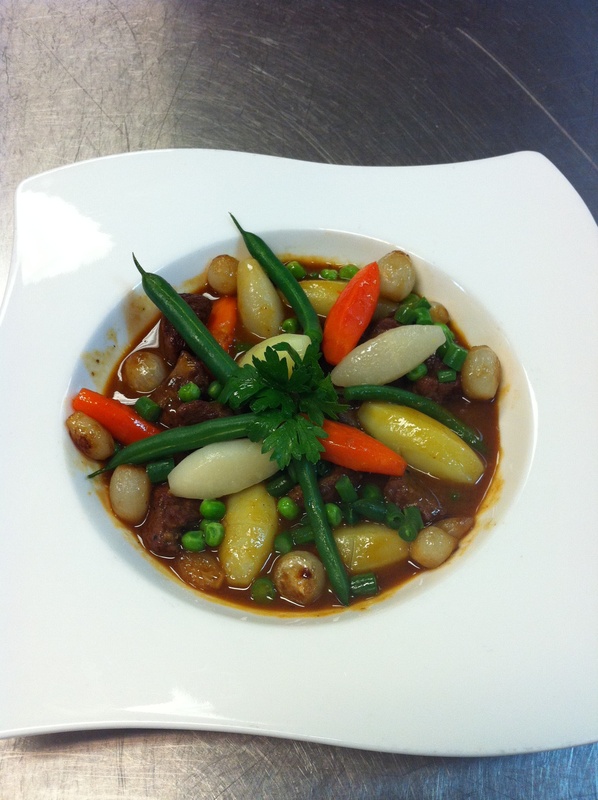 The first I did it was about a year ago when I made Coq au Vin (a combo of Julia Child’s and Alton Brown’s recipes). I used Thomas Keller’s pictures in Ad Hoc to work my way into the 8 pieces. It took me quite some time and I had chicken fat all over me by the end. This time was better, but I seriously need to go buy a bunch of whole chickens and practice. Anyone up for chicken dinner in San Francisco in the next few weeks? Even though our chickens weren’t perfect looking, we got good marks on our sauces. 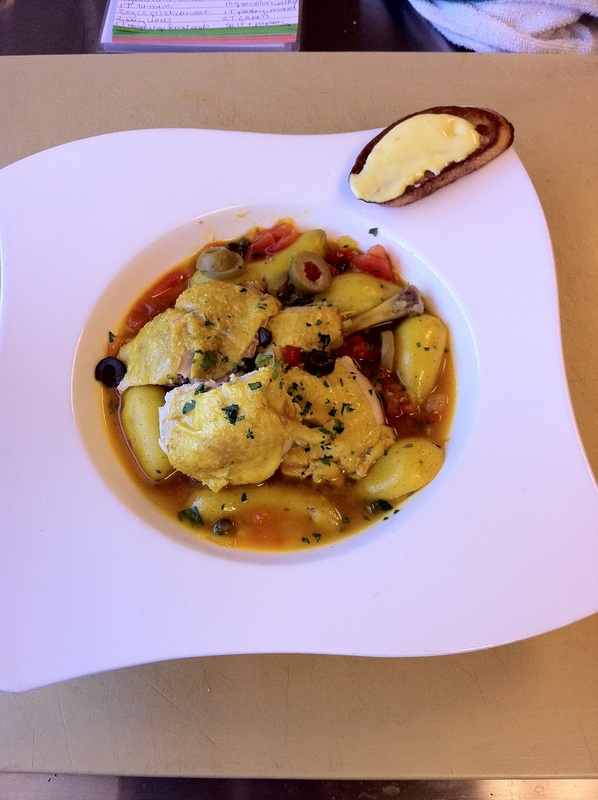 We spiced up our Mediterranean stock and Chef Peter said he liked ours better than the recipe. Woo hoo! Thank you, my darling Carnet, for setting me up with a new iphone. The pictures are way better! 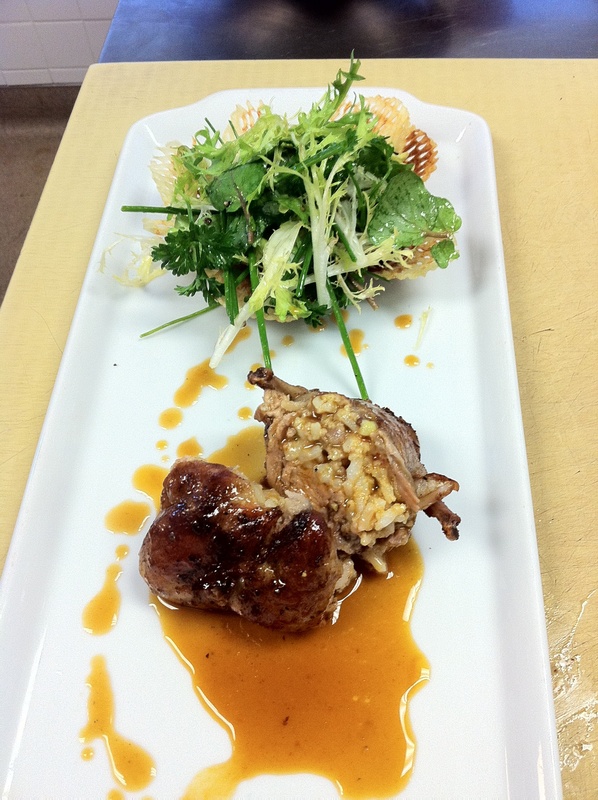 So, onto quail…I had the cutest quail, ever. Well, I think they’re all pretty cute because they’re small, but that’s also the challenge. The picture of the stuffed quail is Tomas’, as I forgot to take a photo of mine before I ripped it into and ate some. Thanks, Tomas! And, actually, I think Tomas’ turned out better looking than mine, anyway. Thanks to Chef Peter for reminding why stemming every salad ingredient is really important. I don’t want to be the elegant woman at a nice dinner picking stems out of my teeth. Now, onto the easiest recipe over the past 4 days, and one of the best for the amount of time put into it, in my opinion: Steamed mussels with white wine, shallots and parsley. Over the weekend, I plan to post more recipes, so you’ll get at least another fish recipe. In the meantime: Moules a la Marinere ingredients: 1) 1-2 pounds of mussels, 2) clams (half the amount of mussels you buy), 3) 1 small bunch flat leaf parsley, 4) minced shallots, 5) about 4-5 oz good, dry white wine (remember the rule: if you’re going to cook with it, pick a decent one and drink the rest of the bottle), 6) bay leaf, 7) butter, and 8) salt and pepper to taste. Directions: 1) Scrub mussels and clams, and if necessary, soak in heavily salted water for 20 minutes to rid them of any bacteria if you’re not sure of their freshness. Also, discard any that don’t close when tapped. That means they’re old. Drain and rinse. 2) Stem the parsley and chop stems and leaves, separately, and keep separately. 3) In a wide saucepan, place the clams, mussels, some parsley stems, a few pats of butter, the white wine, minced shallot, a bay leaf, a few turns of the peppermill, and a splash of water. 4) Cover and bring to a boil over high heat, shaking pan regularly. As the mussels and clams open, remove them to a different bowl off the heat. 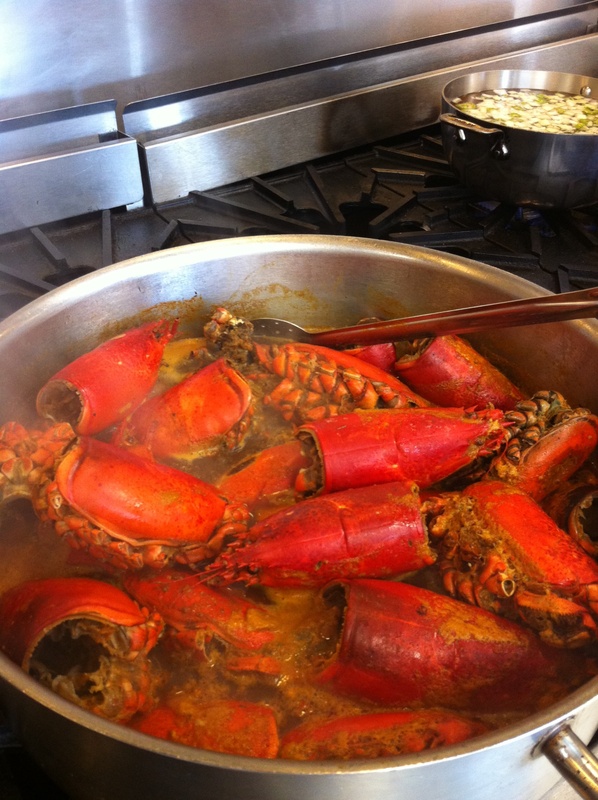 5) Decant the broth so that you leave any sediment in the pan, and strain it into a small saucepan. You should have some clam juice added to the wine to make a nice broth. Bring it to a boil, reduce slightly to intensify flavor, throw in another pat of butter and check seasoning (salt and pepper). 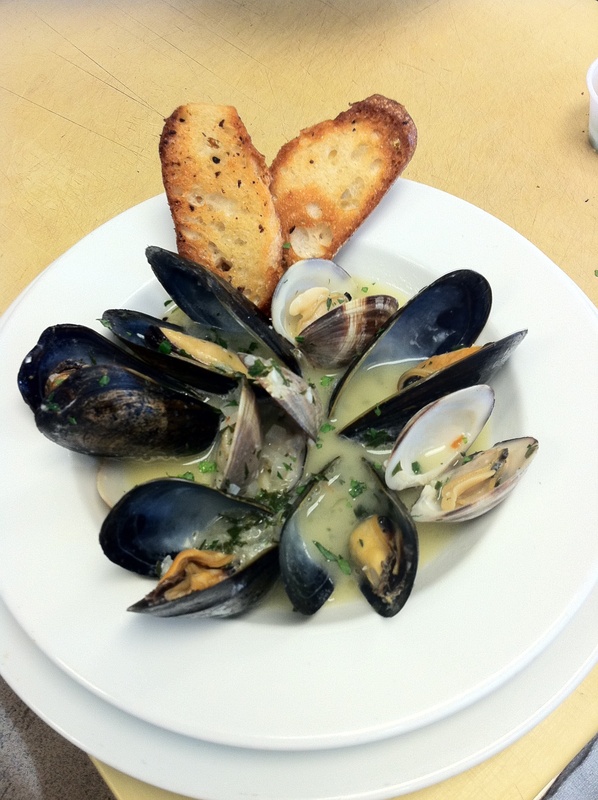 6) Arrange mussels and clams in a wide shallow bowl. Spoon broth over mussels and clams, sprinkle with chopped parsley leaves and serve with crostini to mop up the broth. Check out the picture in the last blog post. E Voila! And, last but not least, I need to give a huge shout out to my husband. He’s running and selling a company and still making me breakfast, making me exercise, and making me dinner on most nights. But, most importantly, he’s excited for me and encouraging me every day. I am so d#$m lucky! Thank you for everything, love. MFMMMA…. 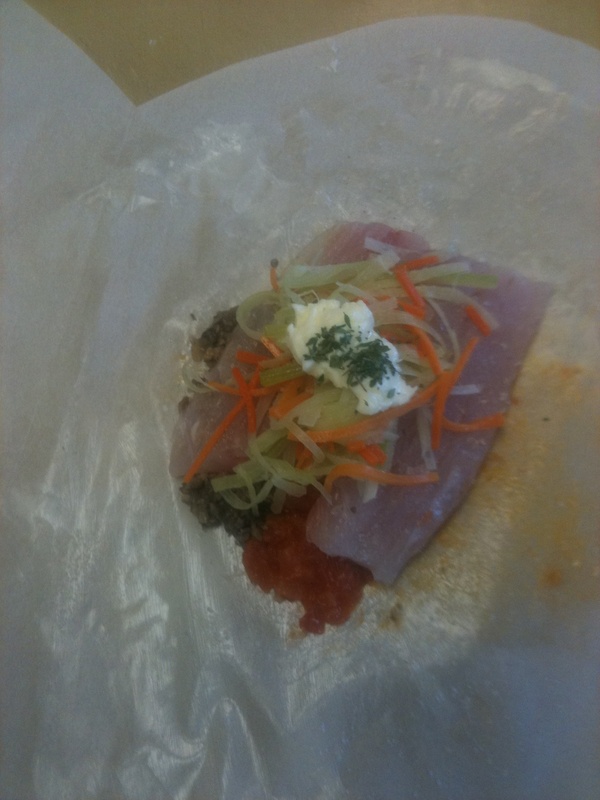 The finished dish above is the result of “Poisson en papillote” (Fish baked in parchment paper). It was delicious. Anne and I had the same problem – we added too much wine to ours, but I told Chef Peter that’s natural considering how much I like wine 😉 I’m not sure that won me any points. At any rate, it was a great process to work through. We each got to play with a whole bass. I think I used 4 different tools to actually get mine clean. I wouldn’t say I “butchered” my fish, but my fillets were not as beautiful as I would have hoped. We also got to clean and fillet a trout for our first fish creation, which was crispy skin pan-fried trout fillets with a brown butter, lemon, caper, parsley, crouton topping. That was also delicious. But, I think the poisson en papillote recipe is more stunning presentation-wise, so I’ll post the recipe here. There are a few different components: 1) fish, 2) tomato fondue (recipe is in Day 10 post and is the same topping for the cooked vegetable salad), 3) duxelles, which is a chopped up and sauteed mushroom mixture, and 4) vegetable garnish, all julienned. Ingredients for Fish and papillotes (yields 4): 1) 4 fillets of red snapper or bass, about 4-5 oz each, 2) 1 T butter, 3) white wine (you’ll just need a splash, so open something good to drink with dinner), 4) fresh thyme, 5) parchment paper. Ingredients for tomato fondue: Look at Day 10 blog post. 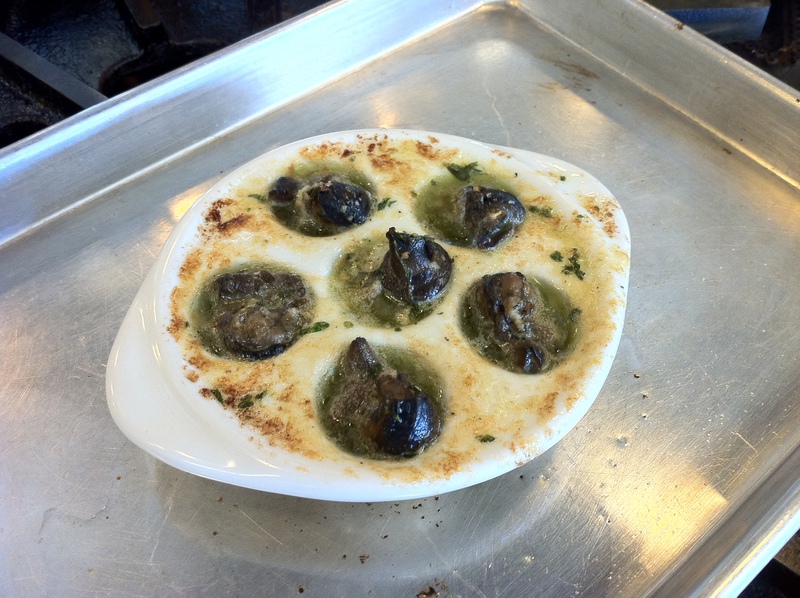 Ingredients for Duxelles: 1) about 8 oz mushrooms, finely chopped, 2) 2 shallots, minced, 3) pat of butter, 4) splash of lemon juice, 5) salt. Ingredients for vegetable garnish: 1) about a handful of each of the vegetables, julienned, for each serving – carrots, leeks, and celery. Directions: 1) Make tomato fondue (or you can use a tomato relish if you have one in the fridge), 2) Meanwhile, blanch the julienned vegetables in salted water so that they are barely tender (they will finish cooking en papillote, so don’t overcook them). Set aside. 3) In a clean pan, saute the shallots and when soft, add the mushrooms, simmer for a few minutes, and then add the wine, salt and pepper. The idea here is to have most of the liquid simmer off, so you end up with moist but not wet/mushy mushrooms. Just before you take them off the heat, throw in just a dash of lemon juice, if you have it, to prevent oxidation of the mushrooms. Set aside to cool. 4) When the three of these items are done, prepare the fish. Wash and dry fillets. Set aside for the moment. Fold a large piece of parchment paper in half and cut it into a large heart shape, so that the seam of the fold is the vertical half-way point of the paper. Open and butter one side of the heart, leaving about a 1 inch rim without butter. Put a small amount of the duxelles mixture near the fold of the heart and the same size portion of the tomato fondue right next to it so you’re creating a bed for the fillet to sit on. Add one fillet on top of those mixtures. Season fillet with salt and pepper. 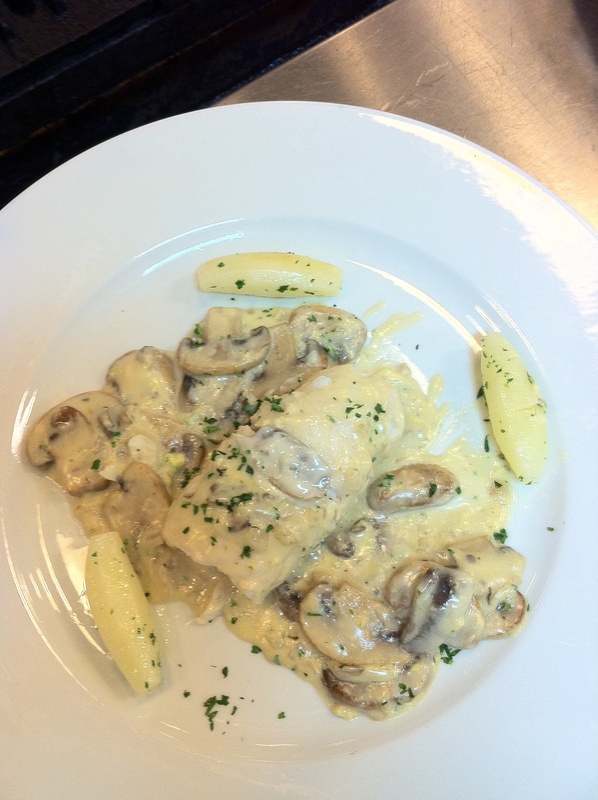 Top the fillet with the blanched, julienned vegetables. Top all with a pat of butter, fresh thyme leaves and just a splash of wine – not kidding on this one. Here’s how it should look on the paper before you close it. 5) Make an egg wash and get out a basting brush. Trace the inside edges of the heart parchment paper with the egg wash and then fold half of the heart parchment paper on top of the other half, so you seal it to make a half heart. The egg wash should help make sure it stays shut. 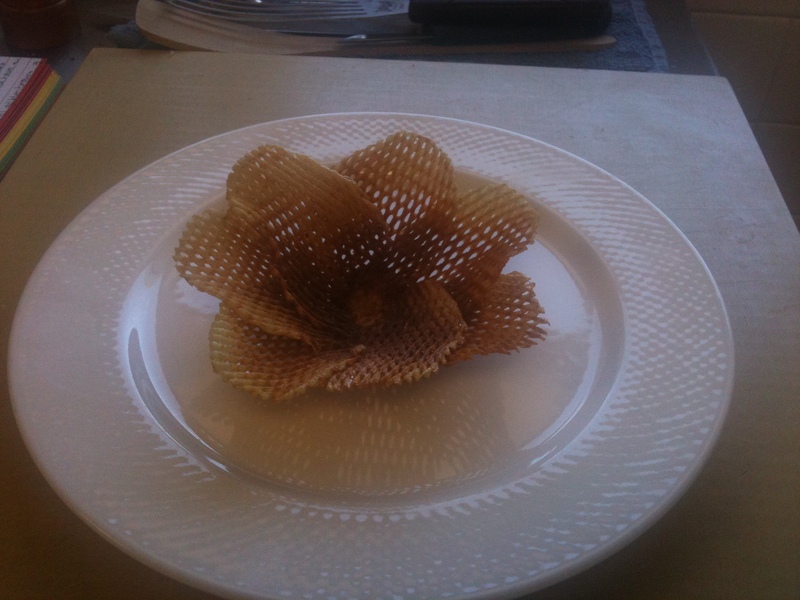 After shut, go around and crimp or make small folds on top of each other with the outer edges. The only way this dish is going to work is if your parchment paper does not let steam escape. It’s all about the steam in this one, kids. Do this 3 more times if you plan to serve 4. Each person should get their own fabulous little packet. Place your parchment packets on a sheet pan(s) and bake at 450 degrees F for about 7-8 minutes (depending upon the size of your fillets). The parchment should puff up and brown a bit on the outside. Plate each one by opening one end of the parchment with scissors and carefully sliding everything out all at once onto a warm plate. There will be hot steam coming out, so don’t stick your face in there. 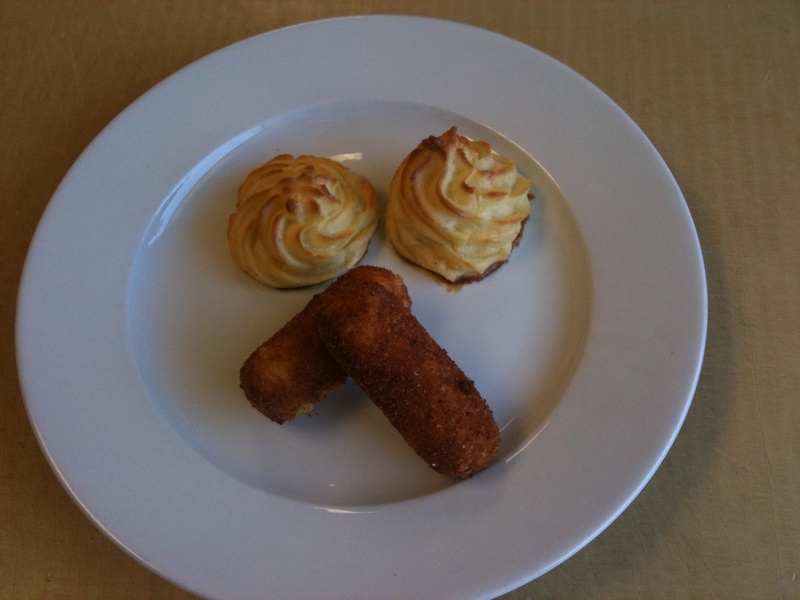 Or, bring all packets to the table, demonstrate for your guests and let them have some fun with it. E voila! 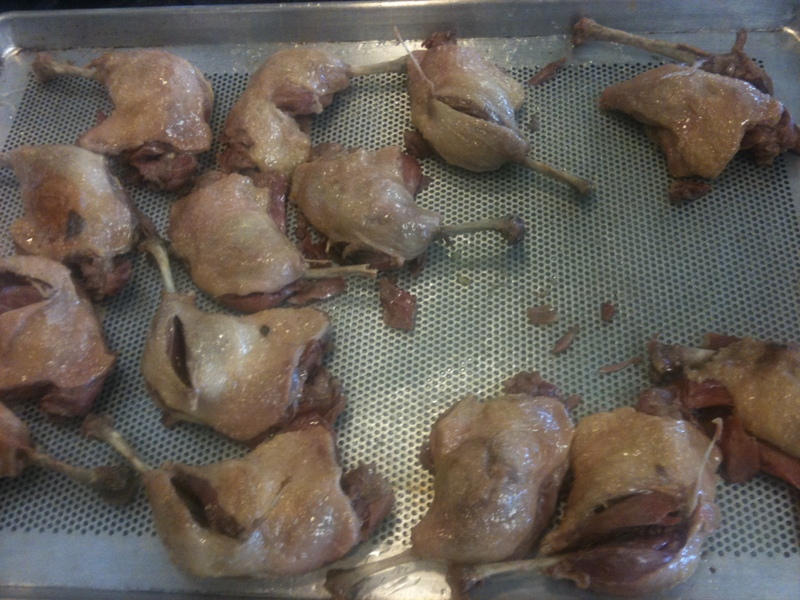 Changing gears, we went back and finished our duck confit we started 2 days ago with Chef Tomm. It has a really beautiful mauve/red color to the inside. 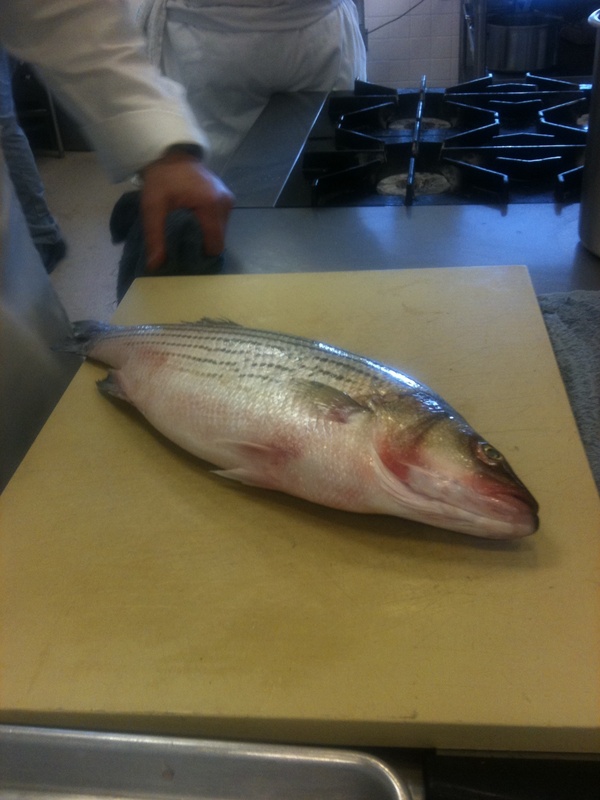 Carnet doesn’t know it, but he’s getting a piece for dinner tonight, along with my and Mark’s portions of the poisson en papillote. That is, right after we have a few drinks down the street at Bar Bambino, where one of the best sommelier’s in the city works. This is going to be a bit of a short post, as it’s 8:30 p.m., I haven’t eaten dinner yet and I haven’t studied for our second test tomorrow. But, this weekend, I’ll post a recipe I liked from today, and I’ll be sure to post one from tomorrow’s fish unit, as well! Today, you’ll have to get the picture of what we did from the pics. 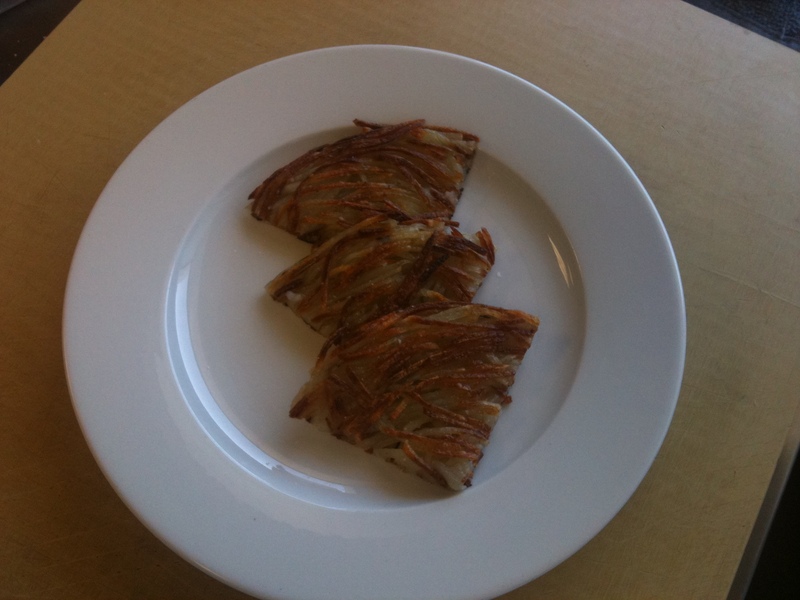 Thanks to my excellent partners, Ian and Anne, we busted out some pretty and pretty tasty potatoes (many, fried!). In order: 1) Croquettes and Pommes Duchesse on one plate (pictured above), 2) Pommes Anna, 3) Gratin Dauphinois (yes this was cheesy and delicious), 4) Pommes Darphin (rosti), and 5) a potato basket made from gaufrette slices (gaufrette is the waffle cut, I believe). The gorgeous basket was Anne’s. The woman has talent, clearly. The shout out from Rick Bayless came 2 days ago, when he tweeted about saltyapron.com and mentioned he liked the gravlax recipe. 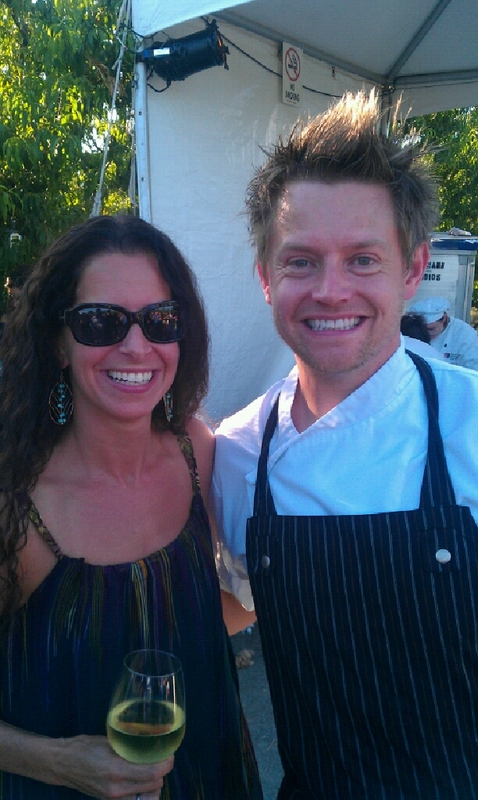 Rick is one of my favorite chefs. I love his Mexican food, and I think there is no one who does Mexican better in the U.S. I have used many of his recipes from Authentic Mexican: Regional Cooking from the Heart of Mexico. His sauces are incredible and his recipes are really accessible with great alternatives and history. I made his Chile-bathed fish grilled in cornhusks for Carnet’s 40th birthday party. It was a hit. Thanks, Rick! You rock. I usually eat a salad everyday, so I was excited by the salad unit today. Unfortunately, I was underwhelmed by this unit. The only salad I thought was interesting and tasty was the cooked vegetable salad with a fondue de tomate. The thought of “cooked vegetables” in my salad was, at first, somewhat unappealing (although blanching and shocking can make for some delicious vegetables in the right circumstances). But, the flavor combinations and presentation of this salad were definitely worth the time consuming steps. The Mark-Rachel “cooked vegetable salad” creation is below. The best two parts about this salad are the tomato fondu on top and the fresh basil puree-mayo dressing. It’s a very rich salad since the dressing’s base is mayo, but it’s also interesting due to different textures and flavor profiles. The tomato fondu topping would be great on a crostini or as a side for chicken, as well. It’s super simple and here’s the recipe: 1) skin, de-seed, and rough chop a few tomatoes (set aside for the moment), 2) sweat about an ounce of diced shallots in butter in a saute pan (saute on low heat, essentially – no browning! ), 3) after the shallots are soft, add the tomatoes, 1 garlic clove that is sliced thinly, and a bouquet garni (in cheesecloth, wrap 10-20 peppercorns, a bay leaf, a couple of sprigs of thyme, and some parsley stems, and tie the cheesecloth to make a small packet), 4) add salt, and perhaps a dash of sugar if your tomatoes are unflavorful, too acidic, or they are out of season, 5) cook on very low heat until the excess water has evaporated and your mixture starts to stew together well, about 20 minutes. Remove bouquet garni and mash remaining tomatoes, etc. with a fork. Taste for seasoning and it’s ready to spread on something. 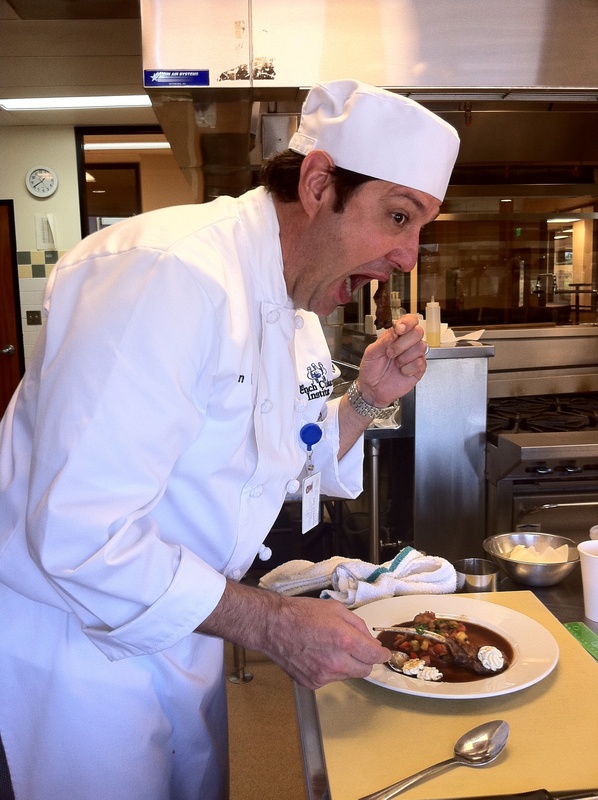 Even though the salad unit was so-so, I was greatly impressed by the nose to tail creations by Chef Pasqual that we were invited to try. He cold smoked salmon, which was excellent, and made blood sausage, salami, ham, and some other thinly sliced/high fat content pork item. He really showed his master skills through these creations. I love the idea of nose to tail cooking and, although I think blood sausage is an acquired taste, I am psyched we learned about some of his techniques. Back to salads…. so to redeem myself, tonight’s salad for dinner will include several of the vegetables we picked up today in our CSA box from Mariquita Farms – spinach, golden beets (which we’ll roast and is Carnet’s favorite), and summer tomatoes. The tomatoes are gorgeous. We’ll dress the salad with a simple balsamic, olive oil, dijon, salt and pepper dressing, which is our go-to dressing I learned in 1990 at the Saint-Cyr home in Lyon, France. Carnet’s making Coho salmon with fresh tarragon to go along with the salad (the tarragon is also from our CSA box). Can’t wait! Today we shook things up in terms of pace. It was a much slower pace than yesterday and, reflecting back on it, I appreciate it. We learned about the many methods of food preservation through the ages – salting, covering with fat to prevent any air from wreaking havoc on food (the confit part), smoking, pickling, and pasteurization. I should have guessed that the word “pasteurization” came from Louis Pasteur who discovered the process and who is hailed as the father of microbiology, also discovering the molecular structure of tartaric acid (one of the main acids found in wines) and the vaccine against rabies. So, what did we make? Well, we started a few things, like the gravlax (gravad lax, in French), duck confit, pickled jardiniere vegetables in a cider vinegar/white wine vinegar/salt/sugar/peppercorns/bay leaf/coriander seed brine, and preserved lemons. 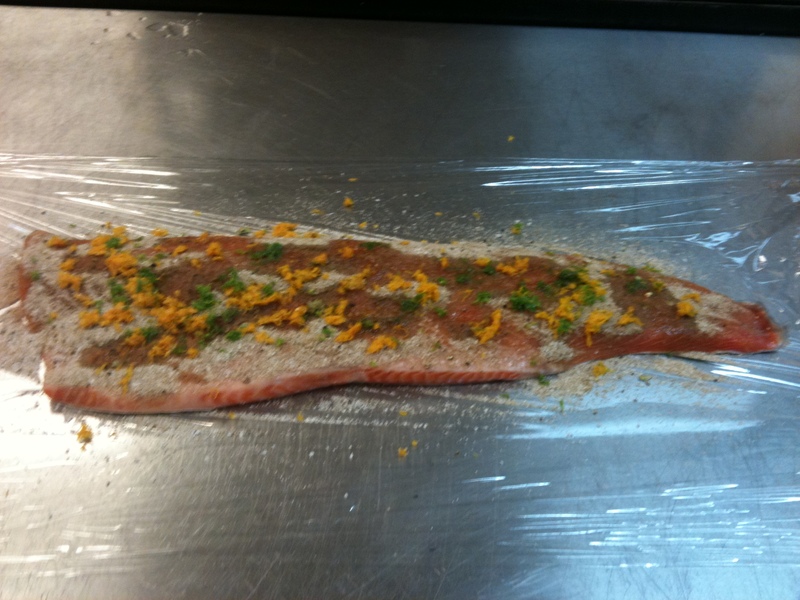 Below are a few pics of Chef Tomm starting the gravlax. The recipe is really quite simple: cover a salmon filet with equal parts sugar and salt. Then add pretty much any herb, other spices and/or flavoring you want to give it. 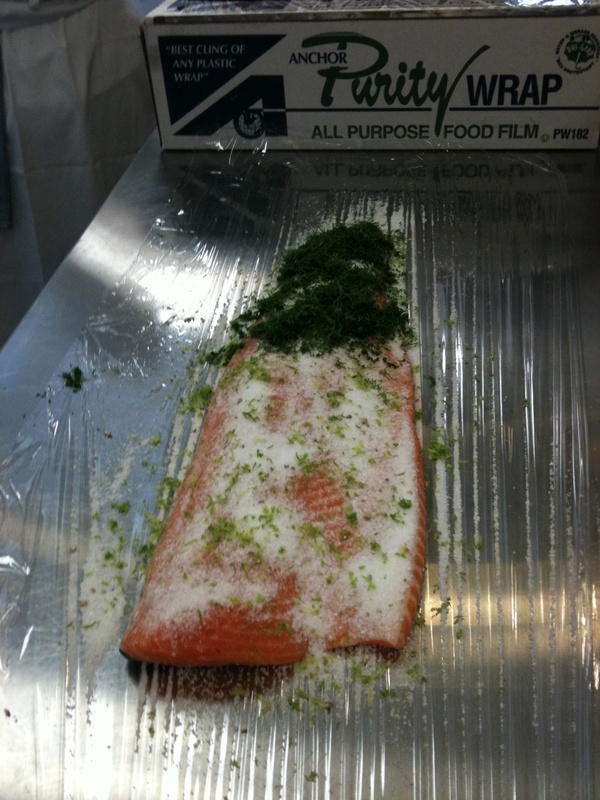 We used a white peppercorn, fresh dill, lime zest and Acquavit topping we sprinkled on top of the sugar and salt mix, to totally cover the salmon. Then, you wrap it tight with 3 rounds of plastic wrap, refrigerate, and let it sit overnight. The recipe in our book calls for weighting it down, but Chef Tomm’s rationale – that osmosis is going to have a harder time working if the flesh is compacted – makes sense, so we didn’t weight ours down. So, what is gravlax? It’s basically cured salmon. The curing is done through the salt/sugar mixture and osmosis. So, you really want to cover your fish completely (only one side; not the skin side). Then, when it’s cured (1-2 days), brush off the cure with a damp paper towel and eat! 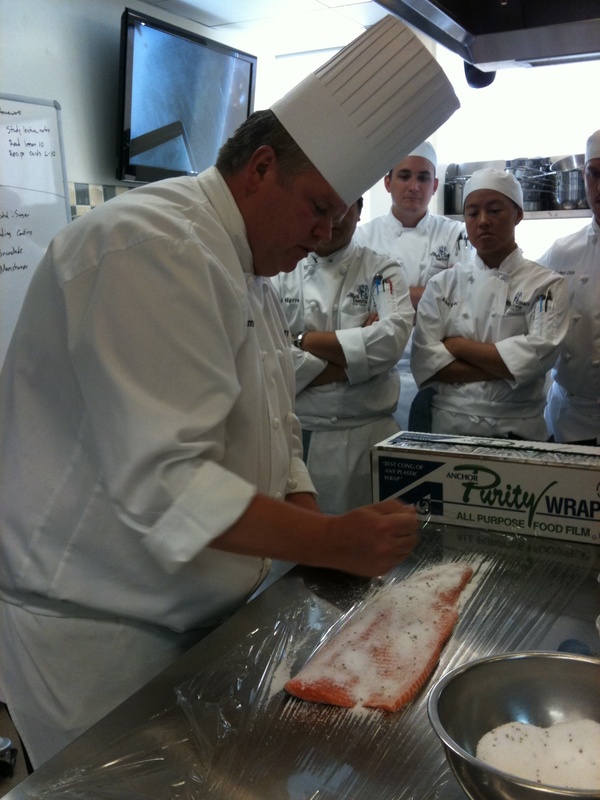 Chef Tomm let the class come up with our own recipe for curing the next salmon fillet. We chose a “sort of” Caribbean, sort of “Jamaican” recipe. We made a spice mix of coriander, cumin, cloves, and nutmeg. For the fresh ingredients, we used a couple of tablespoons of white rum (thought of you, Papa), a diced canned chipotle, fresh orange and fresh lime zest. Here’s our picture. Tomorrow, we’ll see if it turned out the way we envisioned it – with just a little heat. Our pickles, duck confit and preserved lemon have to sit for several days before we get to “finish” them, in the case of the confit, or try them in the case of the pickles and lemons. After the lemons, we learned to make salt-cod fritters. 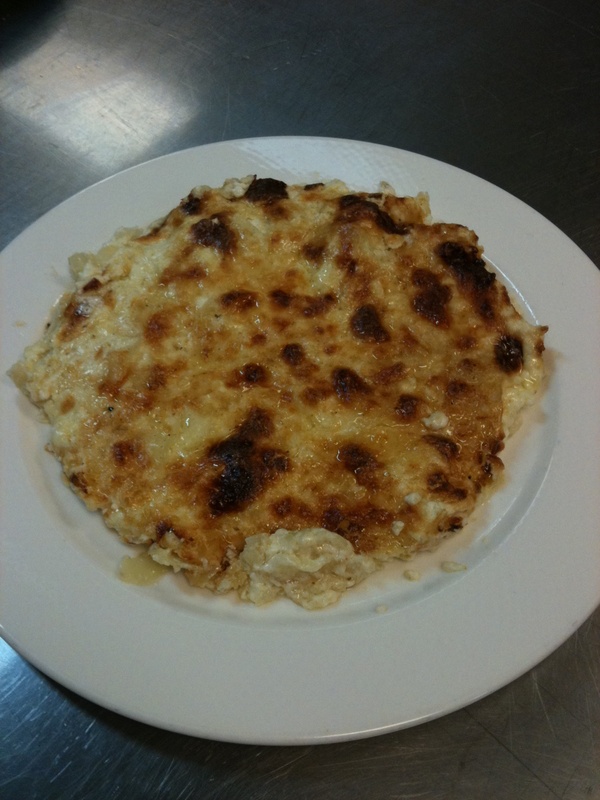 When we tried the Brandade mixture as the recipe called for, it wasn’t very good. But, then Chef Tomm encouraged us to doctor our mixtures with flour, an egg, and baking powder and fry them in canola oil. I had a few partners today – Victor, Bobbie, and Mark – and our fritters (with a hint of cayenne) and the lovely, mustardy mayo that Bobbie made, turned out quite delicious. 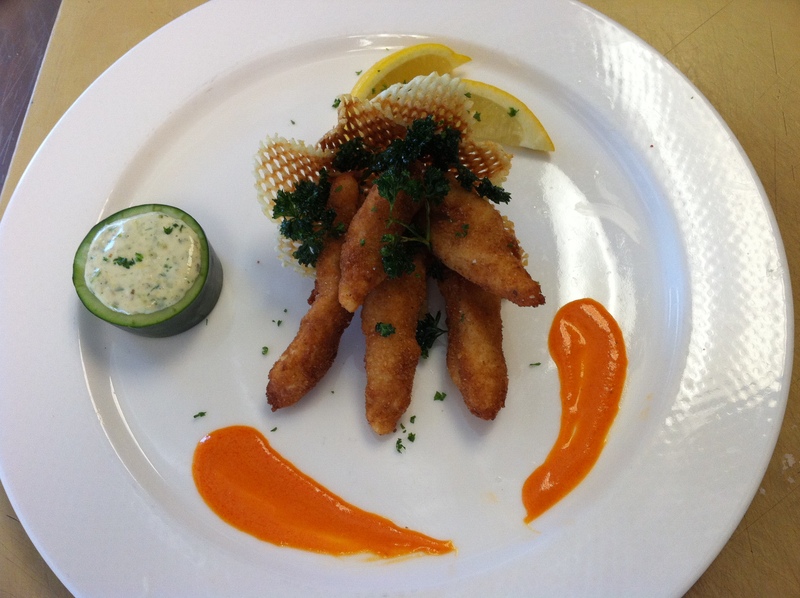 Shannon, with another fish, this fritter recipe is a keeper! 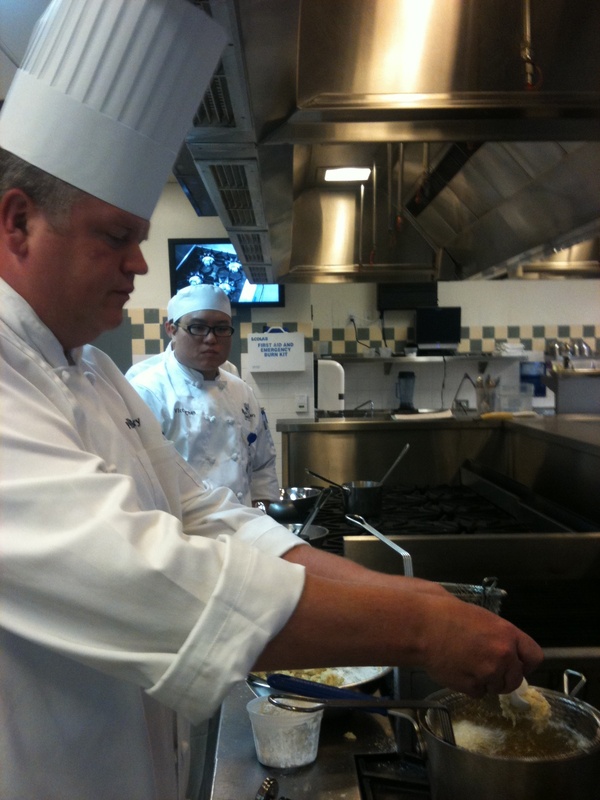 Here’s Chef Tomm showing us how to fry our fritters. Tomorrow, we’re on to salads! I’m most excited about the Salade Niscoise. I’m also curious about the vegetable chlorophyll we’ll be making, which is an ingredient used for flavoring and coloring different sauces. But, tonight, it’s about my husband’s adaptation of Jonathan Waxman’s brick chicken. So, what am I drinking while I’m writing this? 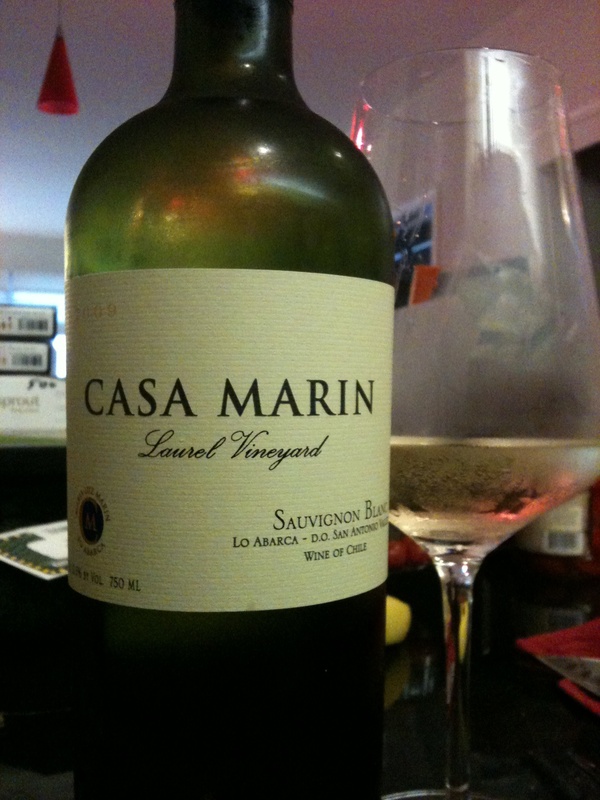 A delicious Sauvignon Blanc from Chile called Casa Marin. It’s a 2009 and it’s a classic Sauvignon Blanc – crisp, grassy, slightly effervescent. Yummmm.